Although the autumn leaves have progressed from sunshine to deepening amber, yellow has managed to retain a strong presence in home design, fashion and stationery. As Stationery Trends mentioned in the Fall 2008 issue, yellow was a dominant shade during this year's National Stationery Show and has proved to be one of the hottest shades for wedding this season. Perhaps what exempts yellow from being tied to a particular season is that it is a colour that pairs well with others. Yellow and white or green tend to be most popular in spring or summer while yellow and grey, black or navy ease the transition from late summer to winter. 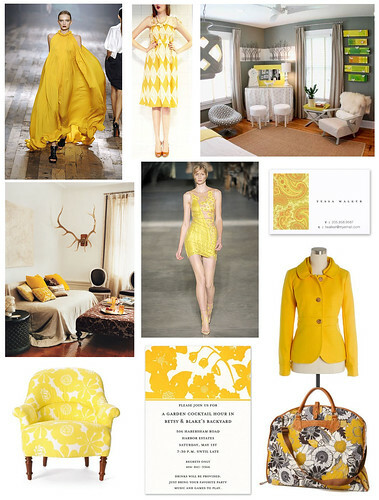 Judging from the Spring Ready-to-Wear runway looks, yellow will continue to shine through 2009.